Remember with this challenge we want to see Clean and Simple creations-lots of lovely white space! I had quite a few ideas for this code word but when I saw this card on the Fresh Squeezed Stamp Blog by Erin I was inspired to use my cassette tape stamp. I really had wanted to use this stamp as my hubby is transferring music from his old cassette tapes onto his mac so he can master them and burn off c.ds. He used to be in a band and this was the only way to tape music back then (yes we are old!!). This was fun to make and quite simple-stamping, masking and I used an impression plate for texture and popped it up on foam pads for dimension. This week we are being sponsored by Paper Nest who are awarding our winner with a $25 gift voucher for their store. I would also like to enter this into a new challenge I came across A Creative Romance. The challenge this week is CAS. I love the music cassette! Cute! Thanks for playing along with us at Atlantic Hearts Sketch Challenge. Sandie,you know how much I love pure stamping cards. The masking is perfect. Great card for Callum. Sadie, your card turned out perfectly! I LOVE that you used the cassette tape and the pop of orange is a great touch. A great interpretation of the Music theme Sandie. Those cassettes brought back lots of memories - Aah, those were the days!! Sandie, like others, I have lots of old cassettes and nothing to play them on. I love your card.I like the simplicity and the memories that it invokes. Yes, I am old enough to not only remember cassettes, but 8 tracks and vinyl records as well! !Great take on this weeks sketch. Thanks for joining us at AHSC. Your card is fabulous. I love the CAS look. I really love the cassette tape too! How fun! :) Great job. Thanks for joining us at Atlantic Hearts! A great interpretation of the sketch. Very unique! Thanks for playing along at Atlantic Hearts. Super card, what a great idea to use the tapes. This is going straight into my CASE file. 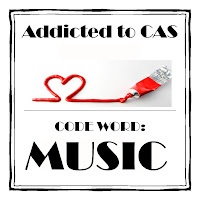 It's CAS perfection and I love it! What a super card for the Music theme Sandie, Brilliant take on it. Oh your card rocks!! I love your CAS design!